Every registred Stats4U user decides about the accessibility of his or her stats page on Stats4U. (f.e. https://www.stats4u.net/en/live/random) You can easily switch the restrictions on and off on our main page after logging in. Either in the main settings or in the advanced settings. You can even decide if some parts (f.e. the MousePlayer, Reports or the User list) are password protected or not. You can take full control of your statistics page by seeing, who has viewed your statistics. This website uses Stats4U, a program for Website traffic analaysis. Stats4U collects data during your visit on this website and provides reports and realistic statistics about site usage and visitor count. 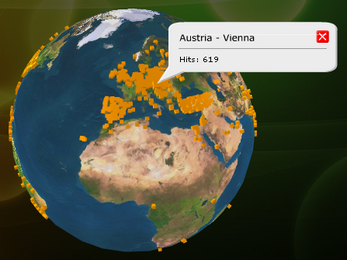 Furthermore, Stats4U sends you cookies to identify your browser and records your mouse movements. The webmaster will be able to see how much you used each function on this website. This program also collects data about your geographical position (Country, City), browser version, browser language and operating system. You can find a complete list on https://www.stats4u.net/en/privacy/policy. Beside all this, you stay completely anonymous. By using this website you agree to the previous statements.